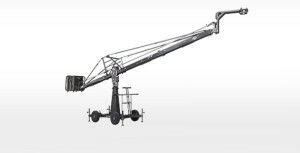 The GF-8 Crane has established new dimensions in the concept of lightweight, rideable and remote crane systems. With it’s 18 versions, the GF-8 becomes a very flexible system. The base can run on 1m and standard Dsdolly track. As confirmation of GFM′s high manufacturing and safety standards, TÜV Süddeutschland have safety type tested and approved the GF-8 Crane System according to European guidelines for the scope of application under EC directives especially EC directive 98/37/EC. This certification is based. *) Transport weight without track, underlay and remote head.